John studied at the Royal College of Music as a scholar under professor Rodney Friend, one of the great orchestral leaders. He also participated in master-classes with Hugh Bean CBE, Ida Haendel and Zvi Zeitlin. John is well known as a chamber musician and for 10 years has been the leader of the highly acclaimed Tippett Quartet, performing, and broadcasting widely across the UK and worldwide. He has recorded extensively, releasing 20 discs with the quartet for EMI, Naxos, Signum, Classic FM, Dutton and Guild record labels. Releases this year include discs of Miklos Rozsa, Lutoslawski and Panufnik for Naxos. The quartet will record Korngold’s tring quartets, also for Naxos in 2014. Tours with the quartet this year include Canada and Mexico. John is gaining a fine reputation as a soloist, appearing with the English Chamber Orchestra with Maxim Vengerov on tour and Stephanie Gonley around the UK. 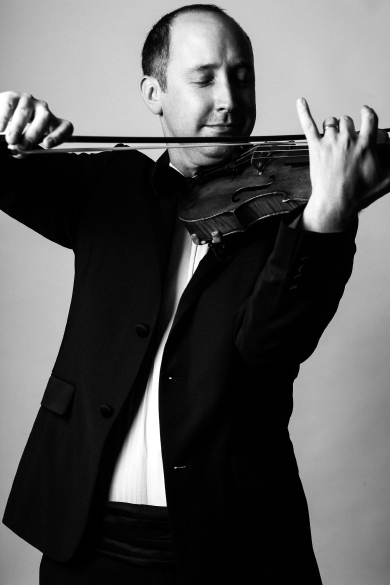 Over the last 10 years John has been performing and broadcasting the major violin repertoire across the UK and abroad, including performances at the Liszt Hall in Budapest and concerts across New Zealand. Other recent performances include Elgar and Glazunov concertos around the UK. John is the co-leader of the English Chamber Orchestra and is in demand as an orchestral leader, groups include the ECO, BBC Concert Orchestra, London Mozart Players, Bournemouth Symphony Orchestra, the John Wilson Orchestra, Rambert Dance Company and others. John Plays on a c.1735 violin by Januarius Gagliano.